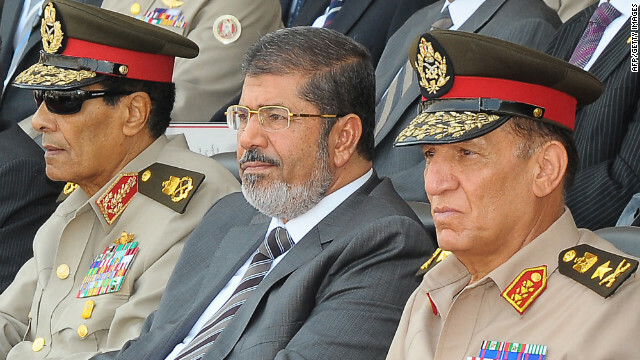 Egyptian President Mohamed Morsi (center), head of the military council Field Marshal Hussein Tantawi (left), and Egyptian armed forces Chief of Staff Sami Anan. (CNN) - Imagine if a U.S. president decided to fire all Joint Chiefs of Staff at once and replace them with generals more to his liking . That's the equivalent of what happened in Egypt this weekend. [:13] "For the first time in the country's history a civilian elected leader has more power than the military...the question is now: will the military accept this, and what will he do with all that power?" [:54] "The immediate concern would be if the senior members of the staff of the military body that has been ruling Egypt refuse to accept this. There could be a military coup. We could see violence between supporters of the military and supporters of the Muslim Brotherhood....."
Egypt analysts are trying to pin down whether Morsi's political muscle-flexing was part of a pre-arranged deal with the military ....or whether the generals were as surprised as just about everyone else. ART ? CAN IT BE USED TO MANIPULATE THE MASSES? WHERE IS MOUNT ZION ? Remains of Jews Massacred on Temple Mount Found? Journalist shows video of mass grave just outside eastern wall of Temple Mount.